Gelibolu (Gallipoli) Peninsula Historical National Park established in 1973 and included in the UN List of Natioanl Parks and Protected Areas, covers 33.000 hectares (330 km2) at the southern end of the Gallipoli Peninsula on the European side of the Dardanelles (Çanakkale Boğazı/Canakkale Straight). 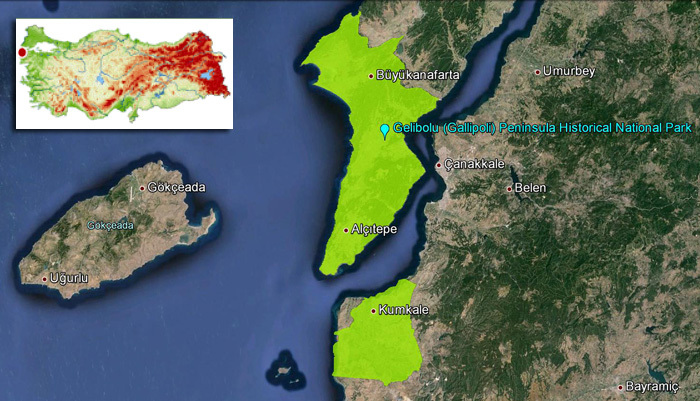 From Edirne and Istanbul, it can be reached from the Tekirdag and Gelibolu (Gallipoli) highways. From Canakkale, there are ferries to Kilitbahir and Eceabat. There is a small domestic airport in Canakkale. Thousands of people visit the war cemeteries every year, and it is one of the most famous sites in Turkey. The battlefields, war graves, monuments, and war related artefacts are registered as “historical sites and objects”. Gelibolu (Gallipoli) Peninsula has been officially registered as a historical site area, and has enormous cultural importance. Within the park, there are also many archaeological sites and monuments, some of which date back to 4000 BC. Between the ancient sites and monuments, there are beaches, bays, an interesting variety of plant life, a salt lake and geological and geomorphologic structures. The thickly wooded hills and valleys of the area are though to have played an important role on the outcome of the war. Gelibolu (Gallipoli) National Park area is located at the intersection of three distinct cultural zones, Southeastern Europe (the Balkans), the Aegean and Anatolia. This implies that it is distant and isolated from the heartland of each cultural formation, and therefore marginal to all. As such, the Peninsula stands as a frontier or a barrier of cultures. During periods of political and economic integration of these cultural and ecological zones however, the Peninsula stands as a meeting place or a three-way cultural bridge-head on a major maritime route. The evidence suggests that once the Peninsula was partially settled, invasions using the so-called land bridge between Europe and Asia began: Thracians from Europe, Persians from Asia, Alexander the Great, the Galatians and Byzantines from Europe and Ottomans from Asia Just as the Peninsula forms a cultural bridge, so does the Dardanelles, linking north (the Black Sea) and south (the Mediterranean). In more stable times, the Strait that borders the east coast of the Peninsula acted as a cultural barrier between Europe and Asia, allowing Asian city-states and the early empires of, for example, the Hittites and Myceneans to flourish. 1915 Çanakkale (Canakkale) and Gelibolu (Gallipoli) battles hindered the Allied forces from taking İstanbul, paralyzing and perhaps dismantling the Ottoman (ie Turkish) Empire; their helping the Russian Empire against Germany and thus ending the First World War for another two years. 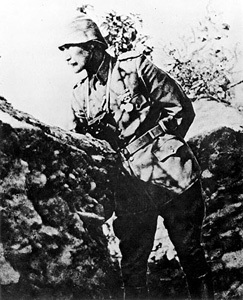 Mustafa Kemal, commander of the Turkish army, led a successful campaign to drive out allied powers from the area. From the Troian War to the 1915 Dardanelles (Çanakkale) battles of the First World War, the motive for belligerencies always remained the same: controlling the Peninsula, a channel-gate and a bridge-heat in one. Nations, armies, commanders and heroes, however, changed. 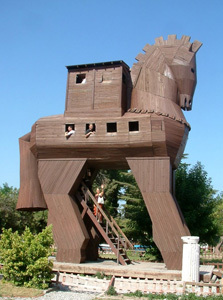 A large collection of major historical personalities ranging from Xerxes, Agamemnon, Priamos, Alexander the Great, Çaka Bey, and Mehmet the Conqueror, to Churchill, Liman Von Sanders, Ian Hamilton, Enver Paşa, Kazım Karabekir and Mustafa Kemal Atatürk have been involved in the area, either to attack, to defend, to fortify or to cross. 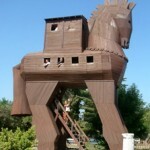 Homer immortalized Troia (Troy) in his stories of King Priam, Hector, Paris and the beautiful Helen. Archaeological excavations have revealed nine separate periods of settlement including ruins of city walls, house foundations, a temple and a theatre. The ancient harbor of Alexandria-Troas was built in the 3rd century BC. St. Paul passed through twice, and then on his third missionary journey, he continued on to Assos. The largest of the Turkish islands, Gokçeada (Gökçeada) is ringed with pristine bays. Its hills, covered with the greens of pine and olive trees, are dotted with sacred springs and monasteries. Regularly scheduled ferry boats make the trip from Canakkale (Çanakkale) and Kabatepe. In August, islanders and tourists gather for colorful local fairs.